The 2018 International Overdose Awareness Day was our most successful ever, thanks to the tireless commitment and energy of hundreds of campaign organisers around the world. The results of this incredible event demonstrate not only growing global awareness about drug overdose, but ensures community calls for action grows ever louder. Although the campaign is convened by Penington Institute, it is a grass roots partnership. Each year on 31 August we come together as one to highlight the ongoing tragedy of overdose and provide a space to acknowledge and remember those affected free of stigma and shame. This year’s Partners’ Report to event and activity holders and supporters provides an update on what we are achieving together. We believe it is important for everyone involved in International Overdose Awareness Day to have a say and learn what others are doing to help out. Now, we want to expand and improve the campaign to create an International Overdose Awareness Day that’s bigger and better than ever. We want you to come on board, whether you’ve supported IOAD in the past or are thinking about doing so in future. Your help will make a real difference. We want to reach more and more communities, and ensure legislators and policy makers hear our demand for a more humane approach to drugs. Download the Partners Report 2018 here. 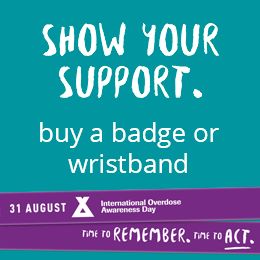 Click here to learn how you can donate to International Overdose Awareness Day 2019.